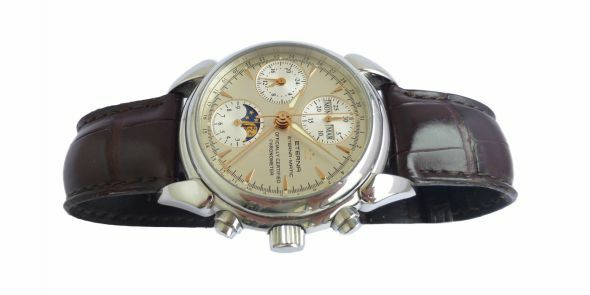 Excellent condition Eterna 1948 automatic moonphase calendar chronograph which is also a certified chronometer. 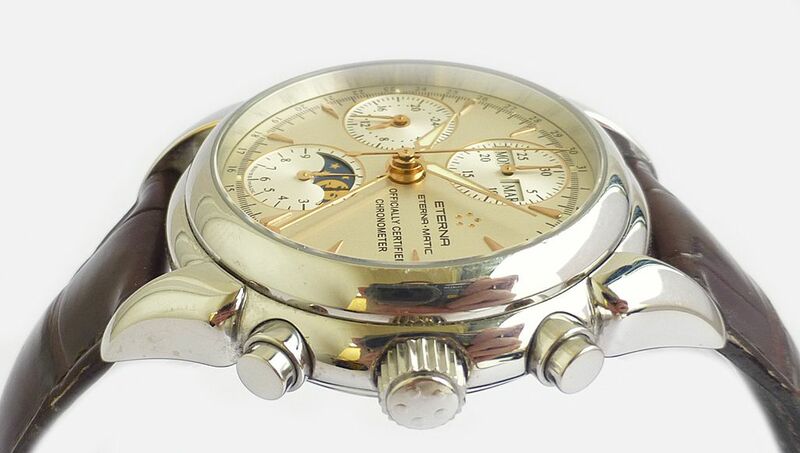 Absolutely stunning looking watch which is in mint condition. The 1948 as the name suggests is a homage to the designs in the late 1940’s so takes on a beautiful classic appearance but made to modern proportions, specifications, with the best materials and movement, so it makes for a vintage classic but made to modern standards. 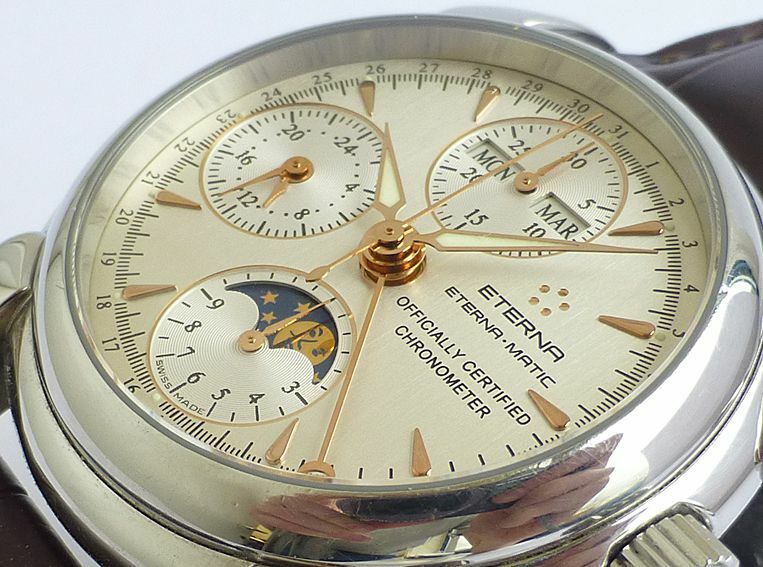 Eterna have been producing high quality watches since their formation in 1856 in Grenchen, Switzerland. 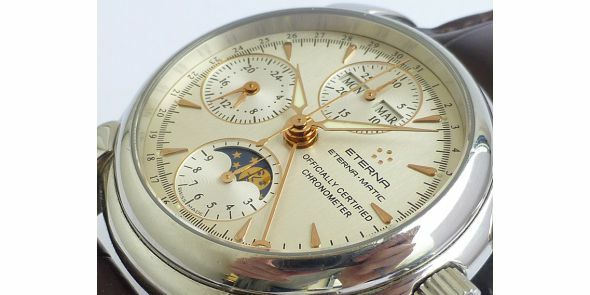 They have been responsible for many horological innovations including the 1948 production of the world’s first automatic wristwatch on a ball bearing mounted rotor – a huge technological achievement of the era, and the Eterna logo still today bears, the five ball bearings. 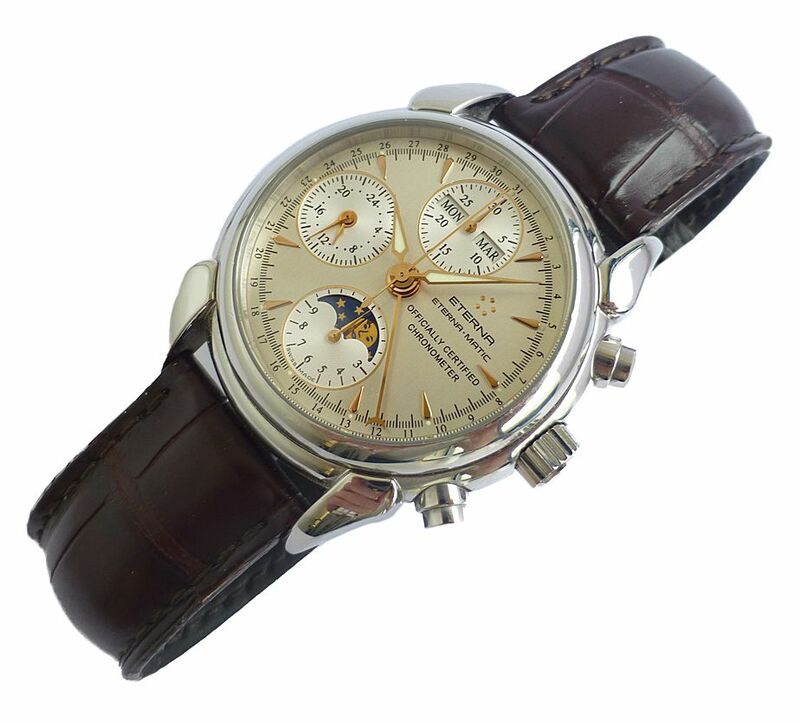 The world of mechanical timepieces experienced a revolution in 1948. 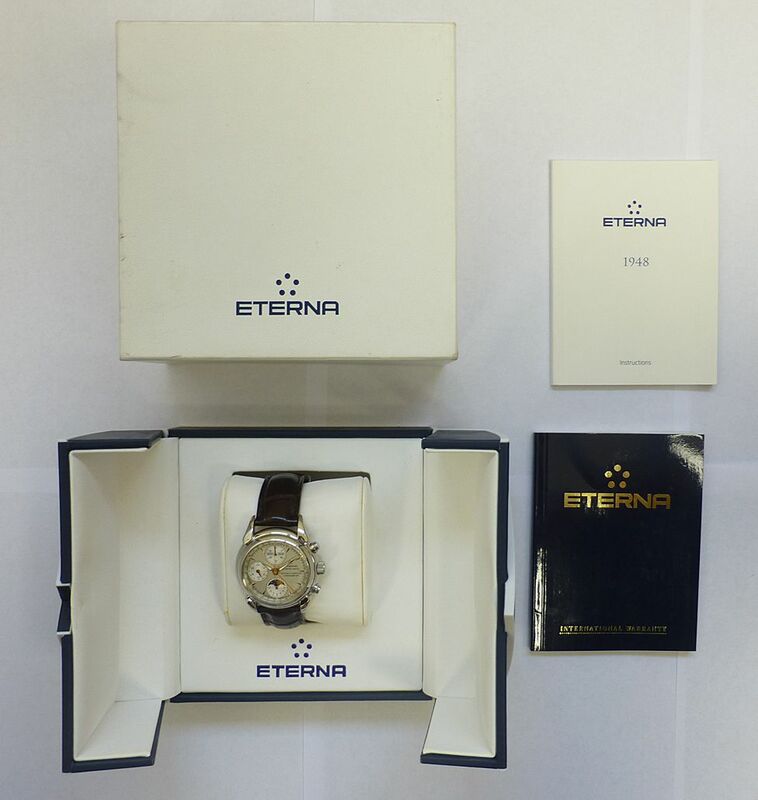 Eterna, one of the most eminent manufactures, had introduced a paradigm change based on five tiny spheres. They thoroughly and permanently eliminated the greatest shortcoming of self-winding movements: the friction-prone rotor bearing. 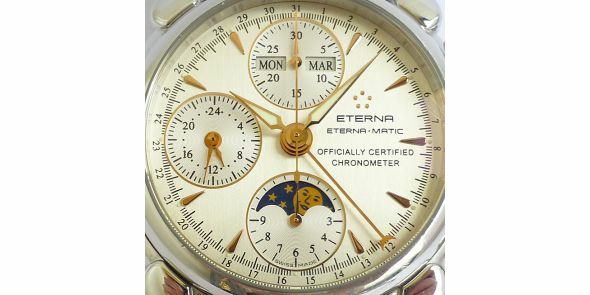 It was only natural that this ground-breaking invention embodied in the Eterna•Matic would advance to become the global standard once the patents expired. 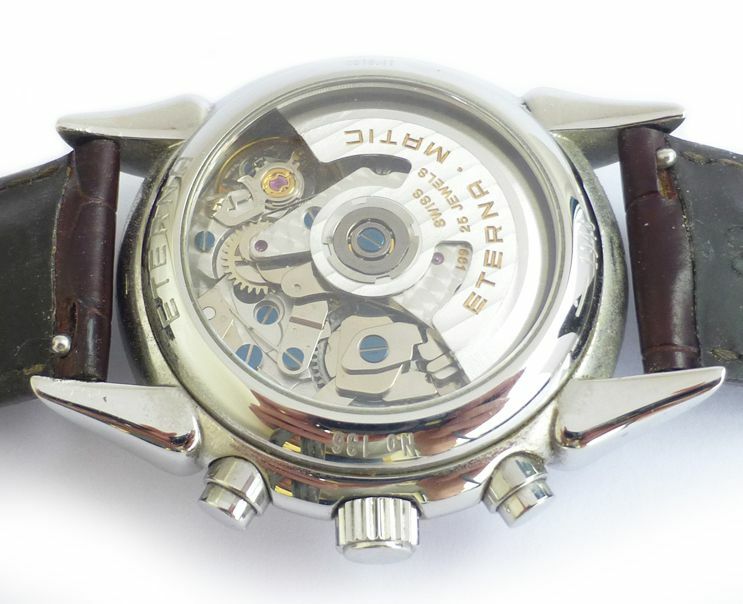 But even then, Eterna had much more to offer: an ingenious system for polarising the motion of the rotor as well as a sophisticated gear train which significantly boosted the efficiency of the winding system. These inventions, too, are still very much up-to-date. 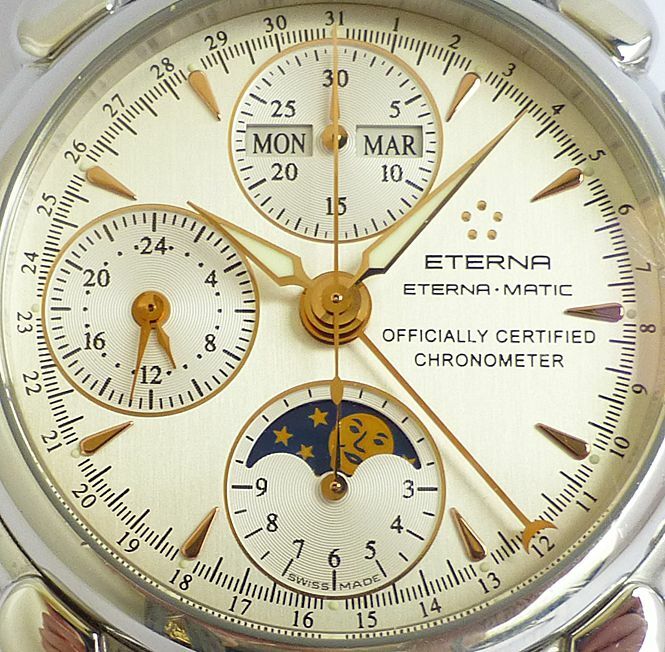 Moreover, precision, quality, dependability and ease of service have always been at the core of the Eterna philosophy. As a salute to this pioneering spirit and in commemoration of the future of the automatic era, the Eterna•Matic 1948 will always rank prominently in the Eterna collections – with its authentic case and the transparent back which reveals the brilliance of the timeless movement with all the details that turned the original Eterna•Matic into a legend. 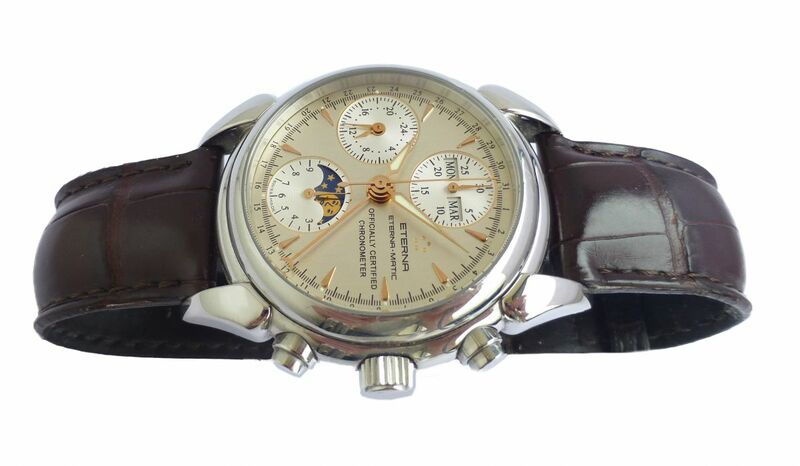 This one has a Swiss made 25 jewel Valjoux 7751 modified for the full calendar and moonphase functions. 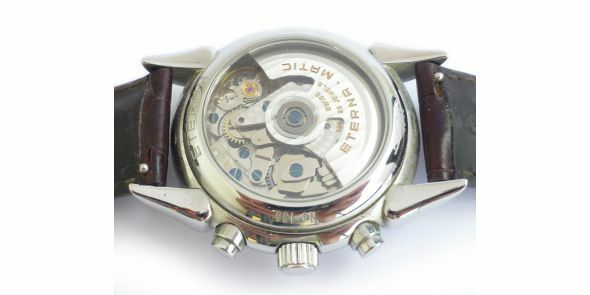 Self-winding mechanical design with ball-bearing-mounted rotor replicating the original; rhodium-plated, decorated by hand, blued steel screws, Incabloc shock absorber, Nivarox 1 balance spring, beryllium balance wheel. 25 jewels. 38-hour power reserve. Frequency: 28,800 vibrations per hour (4 Hz). 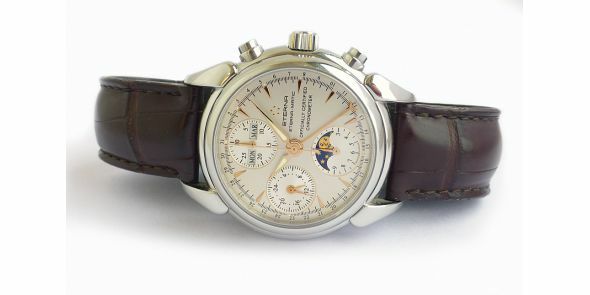 The case is a faithful reproduction of the first Eterna•Matic dating from 1948. 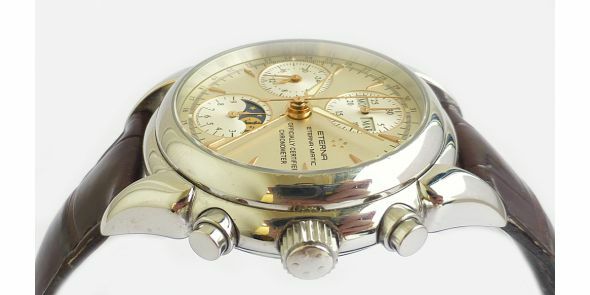 It has a matte steel silver dial with gold numbers, accents and hands. 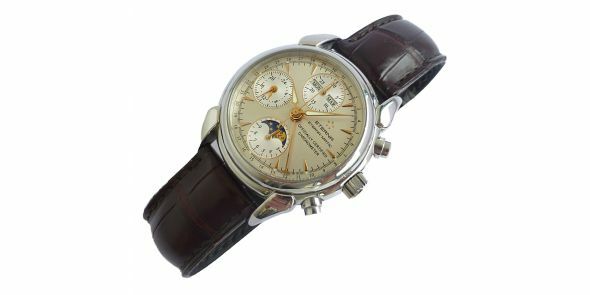 It has a full calendar with month and day in apertures in the sub dial at the 12 position, and the day of the week indicated by the crescent tipped pointer hand, and moonphase in the aperture in the sub dial at the 6 position . The case is polished stainless steel. Has a cambered, anti-reflection-coated and scratch-resistant sapphire crystal. Transparent sapphire case back. Water-resistant to 30 metres. 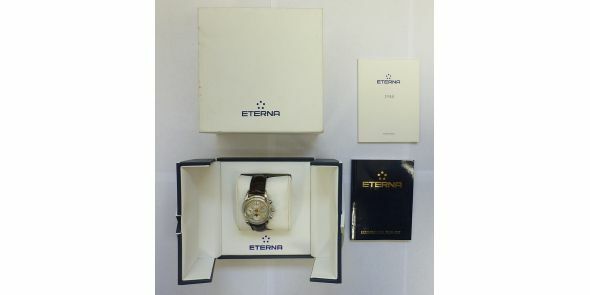 Comes with box, guarantee book, instructions but no chronometer certification papers. The warranty card is stamped by authorised dealers Leslie Davis in London in 2001. 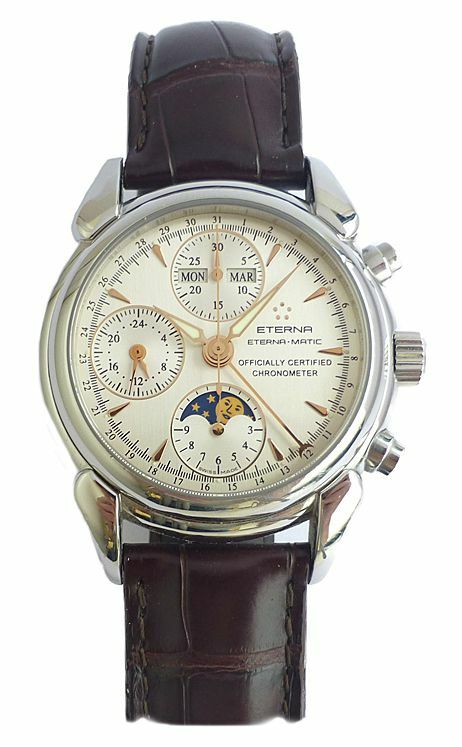 Comes on the original Eterna strap which is worn, could use a new strap, has an Eterna double push button deployant clasp . 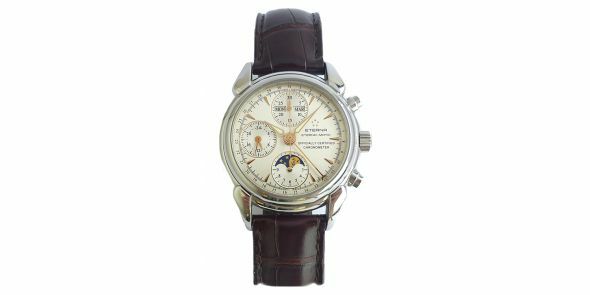 UK retail price is £3,825 or US ,120. 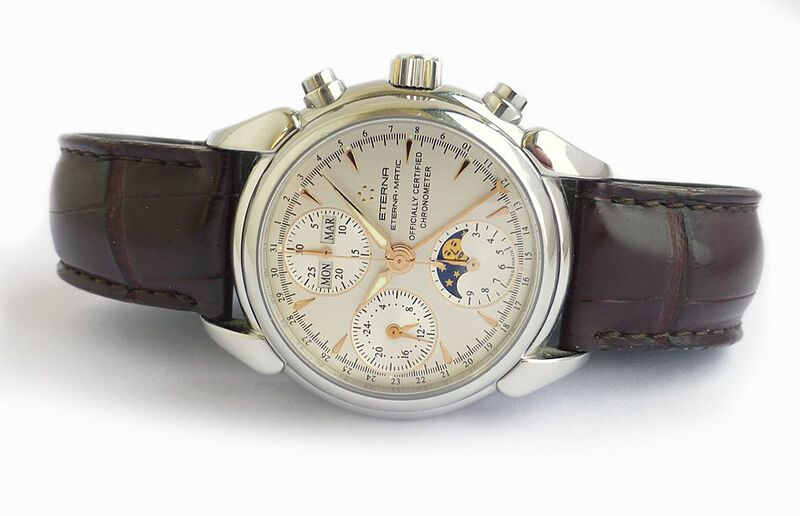 Dimensions are: width 39 mm excluding crown, 42 mm including crown, lug to lug 48 mm, thickness 14 mm.